A great many weeks back, my aunt posted this article on my Facebook wall and wanted to know what my response was. Now that I am finally getting around to writing something about it, I can’t find the post, so it’s going here instead. Aren’t you lucky to get to read it? The Midwives Alliance of North America (MANA) collects voluntarily submitted data on home births from midwives themselves. They don’t do anything with the data themselves except organize it, and accept applications from researchers who do want to do something with it. There is no nationwide requirement for reporting data from home births. MANA comes the closest, but since they do not have the backing of a legal mandate, all the information must be submitted voluntarily. This means both the midwife and the mother both have to agree to submit information. This agreement is made in writing on a release form at the onset of prenatal care with all the other initial paperwork. The midwife starts submitting information to MANA immediately, and continues doing so until the six-week postpartum visit is completed, and the client-midwife relationship comes to an end for that pregnancy and birth. I bring this up because in various circles there are accusations that the data collected by MANA is “cherrypicked” to include the maximum number of positive outcomes and the minimum number of negative outcomes. It is obvious from the process described above that such cherrypicking is impossible. Nobody knows exactly how a birth will unfold before the birth, in fact, unfolds. So unless we are going to run completely contrary to the universally recognized wisdom that birth is ultimately unpredictable (although not without indicators) and begin claiming that every birth can be accurately foretold from, say, the 12-week mark, or any mark prior to the conclusion of birth, accusations of cherrypicking are a lousy attempt to discredit the information which MANA collects. I highly suggest reading the whole thing. I am a big proponent of reading original source documents rather than relying on paraphrased commentary by third parties. The water has the potential to get much, much too muddied for truly informed discourse on the subject. I dislike it equally when proponents or detractors of any contentious issue do not read the source material in question, and draw faulty conclusions or simply parrot what some other commenter, who may have an axe to grind, may have a conflict of interest, may be biased, or may simply not be up to the task of correctly interpreting the facts, has to say. 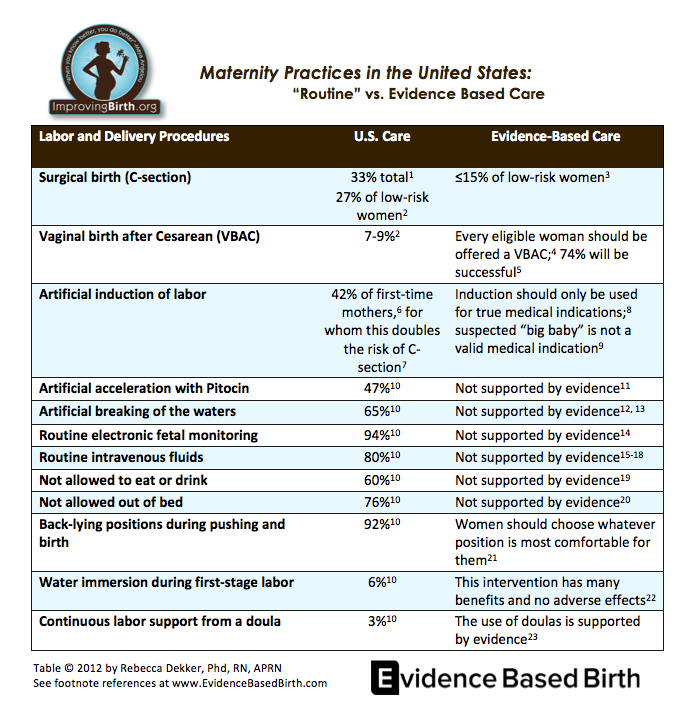 The point of contention here is how home birth stacks up, safety-wise, with hospital birth. In order to have meaningful results, we must start with meaningful data. In other words, the data on both sides must be comparable in every significant way, or else you are comparing apples to oranges. This fact sheet gives an excellent background summary on the issues involved in gathering information on home birth and the difficulties encountered in trying to isolate truly comparable data sets: Interpreting Home Birth Research: Understanding Conflicting Evidence. I don’t want to rehash it all here when it’s already laid out so well, so please read the whole thing before we continue. First off, Dr. Orosz says she is getting her hospital group numbers from the CDC Wonder Database of infant linked birth-death certificates. Already we have a problem. As we read in the above article about what sources to use for comparable birth data, linked birth-death certificates are riddled with confounding factors and are not a good resource for investigating the reality of births. To use this resource as a comparison group to a group whose numbers originate in a research database using different fundamental criteria and definitions is a classic (and in this case egregious) example of apples-to-oranges. The original study does not explicitly state the comparison numbers it referenced to come to the conclusions it reached, but the studies it used are cited in the footnotes. Why didn’t Dr. Orosz do a little bit of homework and investigate those studies? Say you are presented with the statement X < Y. The value for X is explicitly stated. The question is whether the statement “X < Y” is true. The value for Y is not explicitly stated but is discoverable via footnotes. It is the Y value used in the original evaluation which is paramount to determining whether X < Y is a true statement or not. So find that original Y value! Don’t just blindly scrabble around, cobbling up your own Y value from compromised data sources and parameters which only approximate the original parameters of the X value. Perhaps the objection could be raised that Dr. Orosz is a trained, professional statistician and ought to know whether this comparison group is appropriate or not, and therefore it could be assumed that in her expert opinion, she saw no problems with using it and neither should we, who do not Have Degrees in statistical analysis. Well, here’s the thing. Using the CDC Wonder tool and trying to piece together a reasonable comparison group was not her idea in the first place. It was Dr. Amy Tuteur’s idea. She did it first in a blog post, and then when people began challenging her little math exercise, she fished around for a statistician who would analyze the numbers for her and basically give her conclusion an air of legitimacy. So Dr. Orosz is merely following the lead of someone who has no background in statistics and who does have an all-consuming, vicious vendetta against all things homebirth and midwife. When describing what restrictions she put into the CDC Wonder tool’s search function, Dr. Orosz does not give enough details in order to duplicate her results. This is problematic because it means that no one can replicate her process, which is a very important quality for an experiment to have. Most concerning is that she does not specify which causes of death she is including and excluding, and why. She rarely explains her own assertions (for example: her disagreement with the portion of the MANA study which noted that certain subgroups dealt with numbers too small to meaningfully analyze for associations, in the breech birth section) and she does not cite her sources for several paraphrased assertions (for example: the increased risks associated with vaginal breech birth). This bit about low APGAR babies is born purely from ignorance: “Alarmingly, of the 245 infants with low recorded APGARs, 69 were transferred to the hospital intrapartum, but only 66 were transferred postpartum, meaning that over 100 low-APGAR infants did not receive prompt medical attention.” The assertion that a baby who is not transferred to the hospital does not receive prompt medical attention is totally spurious. Midwives are trained in, among other things, neonatal resuscitation and CPR. They bring oxygen with them as well, and perhaps most importantly, they know NOT to perform premature cord clamping. This is extremely important because as long as that cord is thick and pulsing, that baby is still receiving oxygenated blood even if he is not breathing. I know a woman whose baby was born floppy, blue-grey, and totally non-responsive. I don’t recall the exact APGAR number, but it was in the toilet. Her midwife kicked into high gear working on her baby, all while keeping the cord safe and intact, while her assistant was instantly on the phone with 911 as per protocol. It took ten long minutes for her baby to pink up, start to breathe, and respond appropriately to touch and voices. When the EMTs arrived, there was a healthy mother and a healthy baby. That cord provided all the oxygen the baby needed during resuscitation, and her midwife knew what to do and had the right tools at hand to do it. However, the baby did not go to the hospital. She didn’t need to go. Did that baby not “receive prompt medical attention”? One story is only one story, but one story is all you need to break down an absolute statement. It is ignorance of the real tools and training a midwife brings to the birth that could possibly say that hospitals are the only source of prompt medical attention. So let’s do another number-crunching experiment using a better-matched set of comparison groups. I decided to do a bit of exploration using the CDC Wonder infant mortality linked birth-death certificates myself. It is true that using vital statistics is vulnerable to the significant flaws described in the link above, but at least these numbers will all be coming from the same pool of data with exactly the same definitions and parameters. Also, it is the same data pool that Dr. Amy Tuteur and Dr. Brooke Orosz used, so I will use it as well. The results were very interesting. I checked the boxes next to Show Totals, Show Zero Values, and Show Suppressed Values. Rates were calculated per 1000. For the first results, the cause of death fell under the category of “pregnancy, childbirth, and the puerperium”. Hmm. Very interesting. Let’s go on to the other cause of death set: “certain conditions originating in the perinatal period”. Now I am not a statistician and I cann’t tell you exactly what those numbers all mean, but that’s what they are. I’m sure there’s better refinement to be done on what causes of death are and are not appropriate to include. I would love an opportunity to go through all the causes of death with someone better able to evaluate them than I in order to provide more meaningful, pinpointed results. I chose the groups that sounded the most like whether the baby lived or died depended primarily on the expertise of the medical attendant during the typical client-attendant relationship (prenatal period through the 6-week postpartum checkup), specifically focusing on the birth itself, from screening for risk factors during pregnancy to handling neonatal emergencies, and excluded things intrinsically wrong with the baby (like anencephaly; no one can save that baby). Even those groups, however, have subcategories that may or may not have been appropriate to include. This is just an initial, superficial examination of some decent variables, and it was quite interesting to note that at least with these cause of death parameters, home birth with a midwife is indeed as safe or safer for the baby’s life than hospital birth with a medical doctor. So with all this STUFF floating around, all these conflicting reports, foggy numbers, cultural bias, and general misinformation, how is someone supposed to sift through it all and come to a decision for herself? After all, a woman is deciding solely for herself and her currently-gestating baby, not for the whole nation. Well, that’s exactly the crux of the matter. She has to give the greatest priority to the reality she is living in right now. Some factors apply. Many do not. Let’s start talking about me. I am a low-risk, second-time mother carrying a singleton baby. I have never had a cesarean section. I eat properly, take a high-quality prenatal vitamin, get an adequate amount of exercise and sunlight, have never smoked, do not drink alcohol, and am at a healthy weight for my body structure. That eliminates a huge number of potential issues right there. I am seeing a specific midwife in a specific state. I am not seeing a midwife in Alabama where they are not able to practice legally, which means no legal access to lifesaving medicine, inability to order labs, and immense pressure not to transfer or to abandon care if transfer is necessary. I am not seeing a midwife in an unregulated state who put “midwife” on her shingle simply because she’s been at 50 births and just looooooooves babies. I know the scope of her formal and hands-on education, how well she did on her national exams, the breadth of her experience, how familiar she is with other relevant medical personnel and hospitals in the area, what services she offers, what equipment she brings to a birth, and most importantly, I know her specific track record. Every year she provides her statistics for the year and for the duration of her practice. I know her rates of vaginal birth, transfers, breech births, births that resulted in a c-section, intact perineums, average birth weights, APGAR scores, percent babies who successfully breastfed by 24 hours, and more. I know I’m dealing with a midwife who is confident in her skills as well as constantly pursuing continuing education in evidence-based care within the scope of midwifery and its model of care in order to be fully informed and up to date in her practices and recommendations. I’m dealing with a midwife who neither fears nor hates hospitals and is sharply aware of her own limits, and will thus transfer care to EMTs or go straight to the hospital without hesitation if the situation is headed in a direction she cannot handle. She is not a rebel with something to prove, or a hippy who thinks as long as everyone “trusts birth” nothing can go wrong. She is adamant about full disclosure, thoroughly informed consent, and clients taking responsibility and making wise decisions for themselves. There are a lot of lousy midwives out there, and a lot of good ones. She is one of the few who are truly stellar. That also removes a great many risk factors on the part of the care provider. What can an OB offer me as I stand right now, that my midwife cannot? Nothing. I don’t need a doctor right now. If I did, I would go see one, because I’m sensible. I should hope the unfolding of my previous birth proves the point. When I needed a doctor and the equipment of a hospital, I went to one immediately. So why would I choose homebirth with a licensed, certified professional midwife? Personal priorities. I have no need of a hospital or an OB, so I have the freedom to take one or leave one. I prioritize medical advice and care that is based on and borne out by scientifically sound research. I prioritize the individualized, holistic care offered by a midwife who spends an hour with me at every appointment getting to know me and my personal circumstances so that she can take into account my entire situation, offer me the highest form of personalized care she can, and transfer care to a specialist if the need arises. I appreciate that she is available for questions, discussions, clarification, and support 24/7 rather than strictly during office hours and in appointment slots. Another area of personal priorities leading me to homebirth with my midwife is that death is not the only risk. The article and analysis posted by my aunt, which started this whole thing, addressed only one thing: mortality. No other factor was contested. Let’s use the MANA number of 2.06 infant deaths per 1000. What if my baby is one of the 997.94 babies who lives? The larger way of framing this is that people constantly clamor, What if something goes wrong? Well, what if everything goes right? It’s far more likely to happen, especially once all the iatrogenic risks posed by the standard OB model of care are eliminated. If I have no complications and my baby is fine, do I want to have been strapped down in the worst physiological position to give birth short of being upside-down, strictly for a doctor’s convenience? Do I want to have been legally denied food and drink (with the possible exception in some hospitals of ice chips or water) for hours on end during a time when I will need energy the most? Do I want to be depersonalized by changing into their shapeless uniform gown, becoming a pair of legs, without a face, and have my preferences and creature comforts ignored? Do I want to run the risk of tearing stem to stern, or suffering multiple tears, because the nurses insist on directed pushing, and/or the doctor cuts an episiotomy because he “thinks” I “might” tear? Do I want to be bullied into accepting induction if my body does not conform to their narrowly defined and drastically outdated labor progress chart? Do I want to be bullied into a cesarean section if I do not birth within 24 hours of my water breaking, or some smaller window of time determined by the remaining patience of a doctor whose mind is on his dinner? Do I want to be pressured into accepting a needle into my wrist for no purpose at all? And so on and so forth. Every intervention carries with it its own risks and side effects. Pitocin and epidural analgesics are not as harmless as hospital staff and OB would like to tell pregnant and laboring women. Neither are episiotomies and cesarean sections. The pernicious canard that “all that matters is a healthy baby” is despicable at best and dangerous at worst. It means that what is done to the mother is of no concern as long as a baby is extracted who survives and has nothing major wrong with him. Babies are very important. Mothers are important too. The mother can decide what is worth doing or not doing. She is the only one who can decide that. Her body is not some utilitarian vessel for growing and producing babies. It has intrinsic value too. She must be respected and cared for as well. Her humanity and dignity do not vanish when she starts laboring. The two must be balanced. The mother is not more important than the baby. The baby is not more important than the mother. I chose to go to the hospital, even though I hadn’t wanted to. I chose to receive the epidural and the associated IVs and monitors to avoid a c-section, even though I hadn’t wanted any of it. I did it for my son. He matters very much. But I matter too, and objected to being compelled to lie flat on my back. I matter too, and I requested continued perineal support. I matter too, and should have been given the opportunity to object to perineal massage. I matter too, and should have been offered real food (the closest they offered was a popsicle, because I definitely want to eat that when one hand has a needle stuck in it and the other is possessed by a pulse ox) since I was so hungry and had so much work ahead of me. Sometimes I think I had a rare opportunity to experience four different realms during a single birth. The first was labor at home with a support team and no concern about leaving. The second was the turmoil of discovering something wrong with labor and a swift home to hospital transfer. The third was an emergency hospital birth handled perfectly. The fourth was a routine hospital birth horribly mismanaged. I danced several steps to all those tunes. Interestingly enough, I was not afraid at home when we heard the late decels and my midwife told me we were leaving, or during the car ride to the hospital, or while getting stuck like a pincushion in preparation for amnio infusion. I was not afraid until the last doctor rolled in long after all the excitement was over and the problem was solved, and she usurped my role as the principal independent actor in the drama of birth. She took away me. Things were being done to me and I had no say. I was no longer a person. I was an inconvenient means to an end. I do not EVER want to be put in that position again. I choose home birth because it is safe for my baby and for me. I choose home birth so that we may have life, and live it to the fullest. This entry was posted on Saturday, March 22nd, 2014 at 4:10 am	and posted in Uncategorized. You can follow any responses to this entry through the RSS 2.0 feed.